1000 Grit Chosera Water Stone (Green) The Chosera 1000 grit is perhaps the best 1000 grit water stone on the market in terms of performance, feedback and speed. It is an excellent transition stone from the DMT diamonds or coarser synthetic stock stones, and is still able to do less intensive profiling and repair work. It more quickly produces an edge on par with the White (soft) Arkansas stone, and leaves a very usable working edge. 2000 Grit Chosera Water Stone (Tan) The Chosera 2000 grit is the perfect transition stone between the 1000 and 3000 grit stones. 3000 Grit Chosera Water Stone (Brick Red) The 3000 grit Chosera is an intermediate stone that leaves superb working edges that are more refined than the Arkansas black and translucent stones, and best used after the stock KME synthetics and coarser Choseras. Depending on the finish you desire, the 3000 grit Chosera can be used as a cleanup stone before the translucent Arkansas stone. 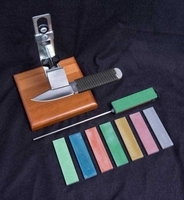 5000 Grit Chosera Water Stone (Gray) The 5000 grit Chosera takes your edges to a new level of refinement. It's smooth with a little bit of "bite", and is a good follower from the 1000 grit, and 3000 grit Choseras or either the black or translucent Arkansas stones. 10000 Grit Chosera Water Stone (Pale Green) The 10000 grit Chosera is best used after refining with the 5000 grit Chosera, and takes your edges to even higher levels. The shine of the finish alone is enough to impress, but the functionality of such a highly refined edge really speaks for itself. Call Us Any Time: 800-561-4339 or 973-948-6234 Copyright © 2006-2017 KME Sharpeners, LLC All Rights Reserved.